Valentine’s Day is fast approaching, and some retailers have begun their prepare their campaigns while others will leave it to the last minute as a reactive campaign, either approach will be piggy-backing off the rush for the most romantic purchases. While it is true that many Valentine’s Day-related searches occurred within 2 weeks before February 14 in 2015 and last-minute shoppers sent searches soaring on Valentine’s Day it does not illustrate the full picture of the holiday's pulling power. We take a look at how South African's react when Valentine's day comes knocking! Top 5 South African Valentine's Day keywords So what do South African hearts desire when turning to search engines you may ask? Here are the most popular exact phrases used by South Africans' when on the prowl for Valentine's Day related content. Top 5 South African Valentine's Day topics Here are the most popular searched for topics around Valentine's Day in South Africa. Top 5 South African Cities searching for Valentine's Day These cities have the highest uptake in Valentine's day related searches when compared to the total amount of searches from the specific area. 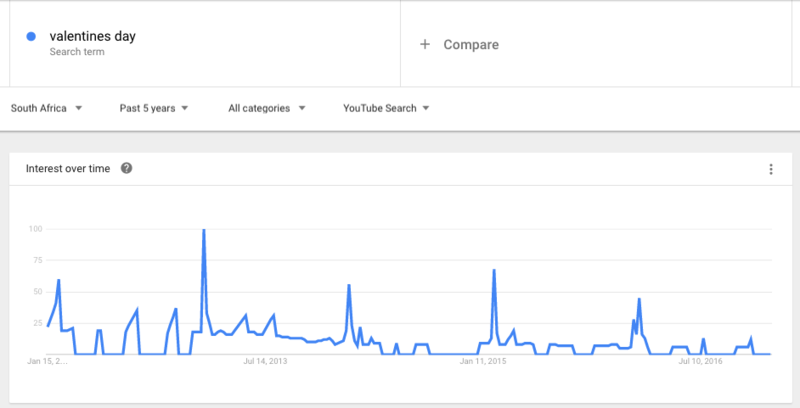 If we take a look at the last 5 years Valentine's Day related search interest begins to peak as early as December the previous year. So if you're preparing for Valentine's day in the final week of January you're already late to the party and missing out on a substantial amount of search traffic. Missing out on being the preferred destination for Valentine's Day related content, products and eventually purchases. When Valentine's Day related searches begin to peak in South Africa. 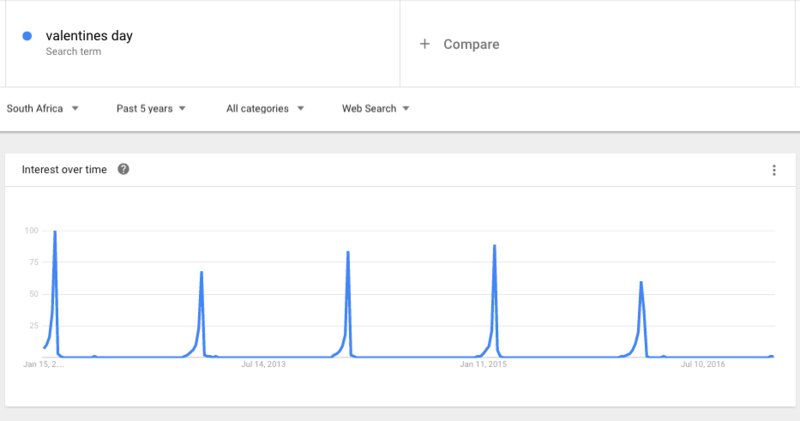 If we have a look at the search interest for valentine's day media there is a much more consistent interest over the year period and not as cyclical as general searches. This puts the amplification for Valentine's day media at a premium. Anyone looking to build on consistent visitors following the Valentine's Day spike should definitely look into creating or curating Valentine's day media, be it video or music. These regions have the highest uptake in Valentine's day video searches when compared to the total amount of searches from the specific area. While the majority of South Africa's Valentine's day related searches will be done via mobile, at close to 60%. It's still worth mentioning that South African's are cross-device purchases and the majority of purchases will be done via desktop. Sites who are mobile friendly and have cross-device accounts or personalisation will be able to take full advantage of Valentine's day rands ready to be spent. If you don't want to miss out on Valentine's Days potential sales, check out our article about how to prepare targetted marketing for holiday's and special occasions.